It’s hard to know if certain dishes are annoying because they need to be annoying or just because that’s tradition. Many people see risotto as a fairly annoying dish to make just because you have to hover over it, stirring regularly, and constantly adding hot stock to the rice until it’s done. Sometimes it’s worth it to challenge tradition just to see if there’s a better way to do the dish. Over the last year or so I’ve seen a few different versions of a baked risotto dish. Basically, the idea is to bake the rice in stock and you’ll hopefully end up with something very similar to risotto. An experiment was in order to see if I’ve been stirring and stirring all these years for no reason whatsoever. A cheesy baked rice dish made with arborio rice that sort of resembles risotto. Not quite the same thing, but very easy and very tasty. 1) Dice onion. Preheat oven to 350 degrees Fahrenheit. 2) Add oil to a large dutch oven over medium heat. Once hot, add onion and a pinch of salt. Cook until onion is soft, about six minutes. 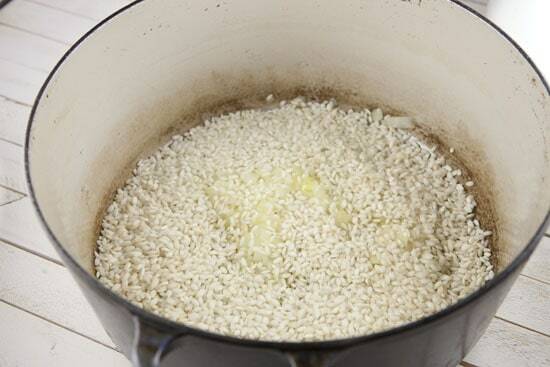 3) Add rice to the pan and continue to cook and stir for 1-2 minutes to heat rice. 4) Add beer or wine and stir until pan is dry. It’ll just take a minute to cook off the liquid. 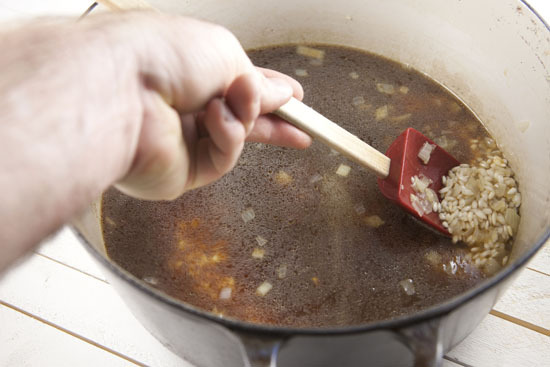 5) Add stock and stir together. Cover and bake in the oven for 45 minutes. 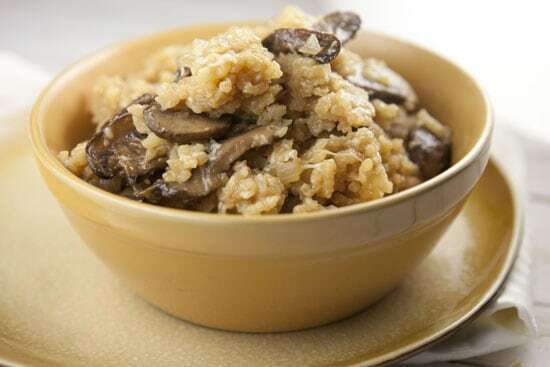 6) While casserole bakes, slice mushrooms and saute them over medium-high heat in 2-3 tablespoons melted butter until they are cooked through and slightly browned, about 8 minutes. 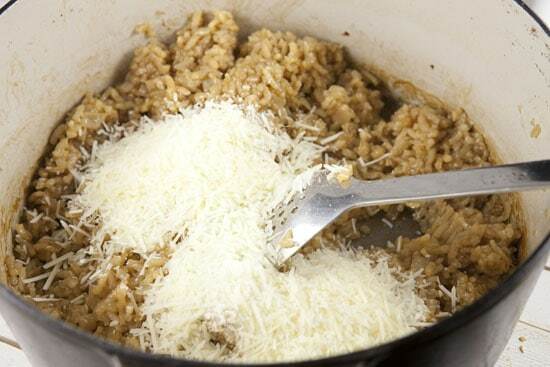 6) Remove dish and stir in Parmesan. Stir in mushrooms and season with salt and pepper. After making my version of this baked risotto, I was half disappointed. I was disappointed because I didn’t really think it resembled risotto in any way other than that it was made with arborio rice. It wasn’t really creamy like risotto was supposed to be. So, unless I did something very wrong with the recipe, I think I’ll stick to my standard risotto method when I want risotto. That said, this dish is worth keeping because it’s actually delicious. It’s a wonderful rice casserole that is dumb simple to make, but I can’t call it risotto with a straight face. By all means give it a shot if you like a good rice casserole, but don’t expect it to be risotto unless you put in the work. This casserole starts out just like risotto. 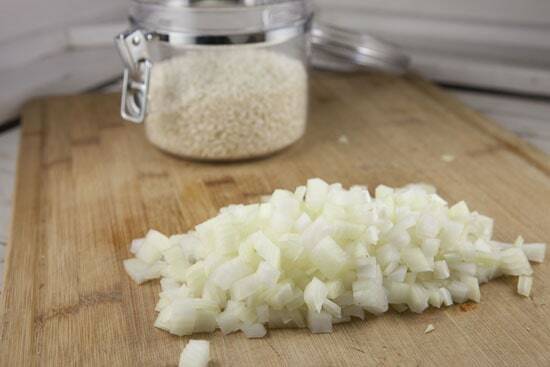 You’ll need some arborio rice and a diced onion. Onions and rice. Nothing fancy. Add your oil to a large dutch oven and heat it over medium heat. Add the onion and cook it until the onion is soft, but not browned, about eight minutes. Then add in the rice and stir it so the rice heats. After a minute of cooking, the rice should be hot. Then add in your beer or wine and stir until the liquid is evaporated. That should take all of one minute. Here’s the step where the casserole and the risotto diverge. If you wanted to make risotto you would slowly start ladling in hot broth and stirring the rice for about thirty minutes. For the simple casserole version, just pour in all the stock. Done deal. Cover this sucker and bake it in a 350 degree oven for about 40-45 minutes. When it comes out, all the liquid should be gone! After a nervous 45 min. When I started stirring the rice to add in my Parmesan, I noticed quickly that this wasn’t the risotto that I loved. It just wasn’t creamy enough. Anyway though, stir in that cheese! While the risotto cooked, I also sauteed some mushrooms in a bit of butter until they were cooked through and lightly browned. It just gives the casserole some body. 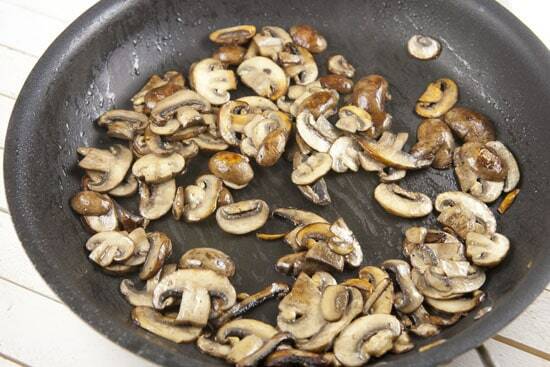 Stir the mushrooms in to the rice and season the dish with salt and pepper. You probably won’t need much salt because of the stock and Parmesan cheese. Serve this up as soon as possible! Some sort of good casserole. To be completely honest, I’ve never really thought risotto to be all that hard. I make it on weeknights. You could actually make this risotto faster than the casserole version, you would just have to stir it while it cooked. For a rice casserole though, this is pretty solid. You won’t hear me call it risotto though. Has anyone else tried this method of cooking risotto? Leave a comment! It did look tasty like a good rice side dish but whats the point? I don’t stir “constantly” when I make risotto so it would be just as easy while doing other things in the kitchen. Yes! This is pretty much the only way I cook risotto lately and it comes out creamy and perfect. My recipe is slightly different. I get to the step where you start adding stock and I add all of it, usually a little less than what the recipe calls for, then I bring that to a boil, cover and stick it in a 450 degree oven for 15 minutes. Remove and stir in the butter, parmesan and whatever else you’re adding. I don’t mind making risotto on the stove top, but working full time and with a toddler running around, I love it when I find time saving tricks for my favorite foods. Huh! I guess the boiling before baking step would be the difference? I’ll have to give that a shot! This sounds like a tasty mushroom pulao (or pilaff if you please), and there are a million vegetarian variations you could try. For years, I’ve made risotto in a pressure cooker!! It’s super easy. I have graduated to the Cuisinart electric pressure cooker………around $100. I saute the onion, garlic, mushrooms, etc first and remove. I then saute 1 1/2C rice a few minutes in EVOO, add 4 cups stock, a splash of white wine, S&P and pressure cook on high pressure for 6 minutes. 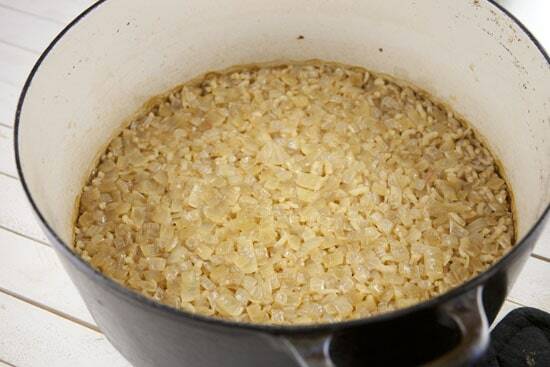 Release pressure, remove lid, add back onions, garlic, etc, add cheese, stir and you have PERFECT risotto in a fraction of the time………..worth buying a pressure cooker just for risotto!! Once you get the basics down, you can go nuts experimenting with different ingredients. Some can be pressure cooked with the rice and some can’t. You’ll get a feel for that as you experiment. Be sure you have left-over risotto for breakfast the next morning with a couple of poached eggs on the top!! YUMM!! Wow. That’s a new one for me Rita. I don’t have a pressure cooker, but assuming that I will have one at some point in the future, I’ll be sure to try this. Thanks for the comment! I just checked………..COSTCO has the Cuisinart pressure cooker online for $85 delivered. Christmas gift idea!! This is essentially a pilaf and I’ve made these all my life. I saute the mushrooms along with the onions and then add & coat the rice. Add the boiling stock, bring back to a boil and stick it in a 350F oven for 20 minutes. Remove and let sit w/o removing the lid for 5 minutes and perfect every time. Evan works great for white rice. Another great variation is to cook your ride al dente then saute your onions and garlic. 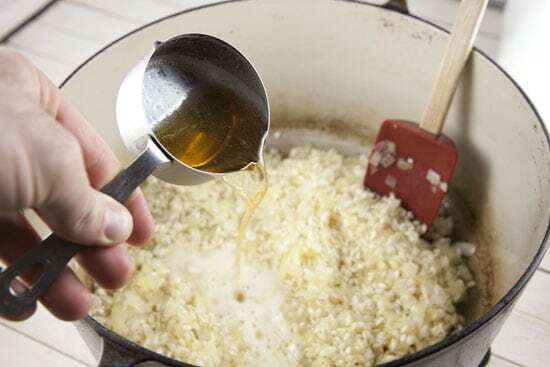 Add in the al dente rice and cook w/o any broth, stock or liquid and you’ll essentially get a nutty flavored rice that is completely different and very delicious as well. You’re right Jim… it’s basically a pilaf. Thanks for the comment and variation ideas! 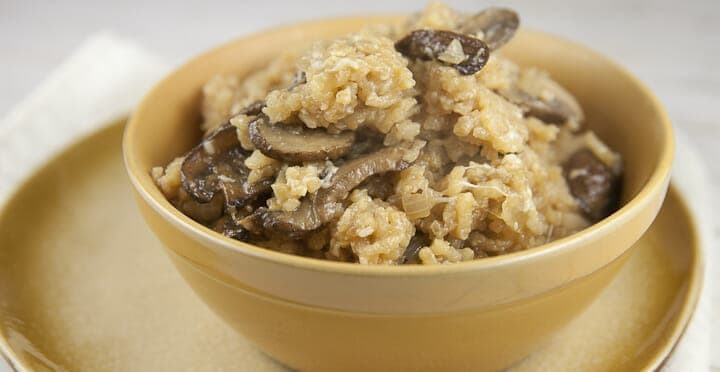 I’ve been told that if you want a no-stir risotto, it’s best to use carnaroli rice, which is similar to arborio but the structure means it absorbs things differently. Apparently arborio absorbs slowly, hence the standing over the stove stirring and adding and stirring and adding, whereas carnaroli stands up to adding it all at once and leaving it. In saying that, I’ve never tried it myself – I find the standing/stirring/adding quite therapeutic! This doesn’t even look like risotto :( I’m with you, Nick. I’ll stick with making it on the stove. It’s more labor intensive than a casserole, but it’s not exactly like it’s hard. And after the first few additions of stock, you don’t have to stir it constantly, anyway. Yea… I had the feeling maybe I wasn’t using enough liquid… thanks for the comment Lauren. I’ll maybe have to give it another go someday. I’ve never even thought of making a baked rice casserole thing. It looks good. I do like things you can stick in the oven and leave to it for a while. FYI…….Cook’s Illustrated is coming out with a pressure cooker cookbook in February 2013 which will include risotto recipes!! DO try risotto in the pressure cooker. Six minutes to perfection!! I tried Paula Deen’s recipe for a baked risotto. While it was easy and tasty it was missing what I think of as the “nuttiness” of stove top risotto. If you add some hot water and stir after you remove it from the oven it will be creamy.